Can I replace the "Contact" link in the navigation with a small email (envelope) icon instead? I understand the value of showing a phone number, but I'm concerned with getting calls at bad hours or at night. What can I do? 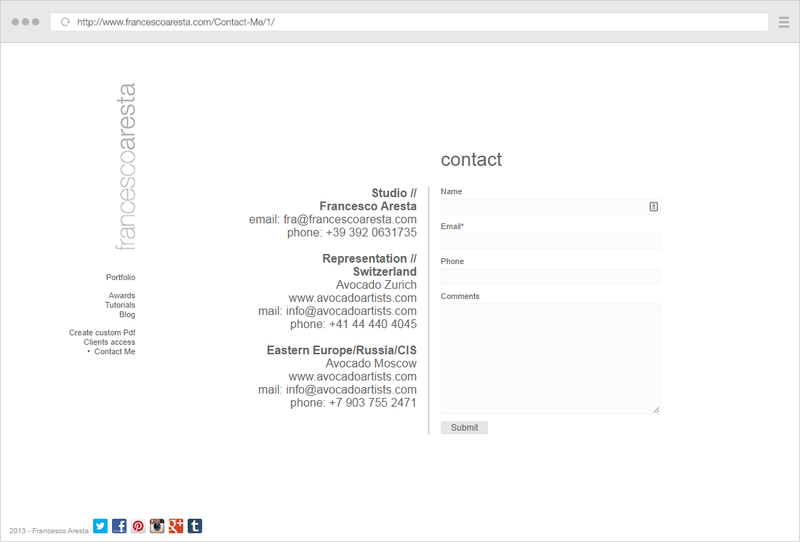 What about how to design the Contact page? 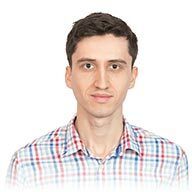 I don't have any web-design experience. How do I add a contact form to my page? Any examples of bad contact pages? 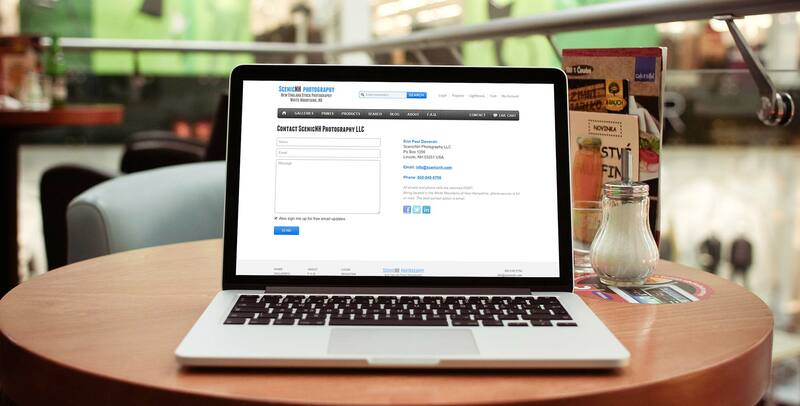 The Contact page is a critical component of your website, often underrated. You simply can’t keep doing the default (bad) things and wonder why people are not contacting you. Simply having a basic contact form there is the absolute minimum. But you could be doing a lot better. A default contact form is not enough to encourage visitors to leave you a message. We’ll have some great examples of photography contact pages later in the article, be sure to check those out for inspiration. 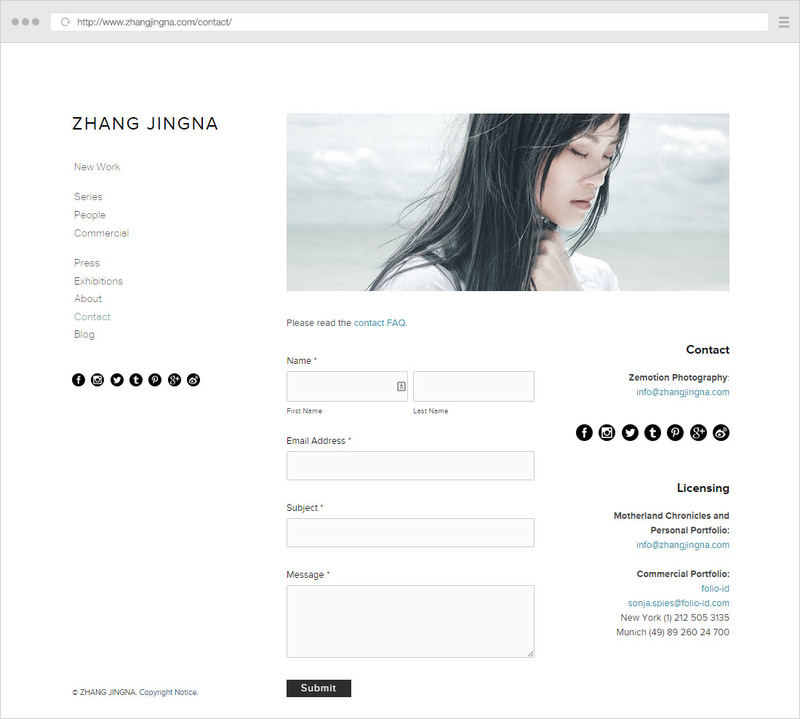 As I mentioned in my guide on Photography Website Mistakes, not having a contact page is one of the easiest ways to avoid clients. That’s not enough, visitors are used to clicking on “Contact” in website navigation to get to the contact info, don’t make them waste time looking for it. This way, you surely won’t. Usability trumps aesthetic. Try to find a good balance (by testing things). That’s OK, but people still should be able to get in touch with you for requests, suggestions, praise, problems etc., or just for sending you Chuck Norris jokes. Why miss out on that? Same thing, see above. Networking is not just about getting work, it’s about developing relationships, making friends in the industry etc. These arguments simply don’t justify not having a good Contact page. Always make sure it’s an email link, so people can click on it to write directly in their default email client. Don’t make it text-only (without a link), that forces people to manually copy-paste it. And worst of all, don’t make it just an image, making people type it in manually. I suspect a good portion of people won’t go through this hustle. If you’re concerned with spam, looking into email obfuscation strategies you can implement. Still getting some spam? Think about it this way: it’s a small price to pay for making things easier for your visitors. It looks a lot more amateurish to see personal Gmail/Yahoo/etc. addresses, so consider creating an email account with your hosting provider (and then add it to your favorite email clients of course). A location should always be visible on your site, and the Contact page is a great place to have it on. Even if you’ve already mentioned your location somewhere else on the site (like on the About page or in the footer). Even if the location is already in the name of the site/business. Even if it’s already in the logo. 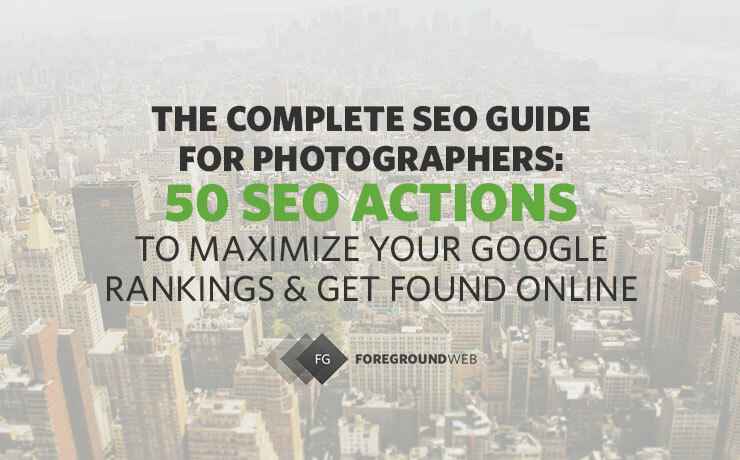 This will increase credibility and the number of people contacting you if they’re looking for location-specific photographers, which sometimes is an important hiring factor. 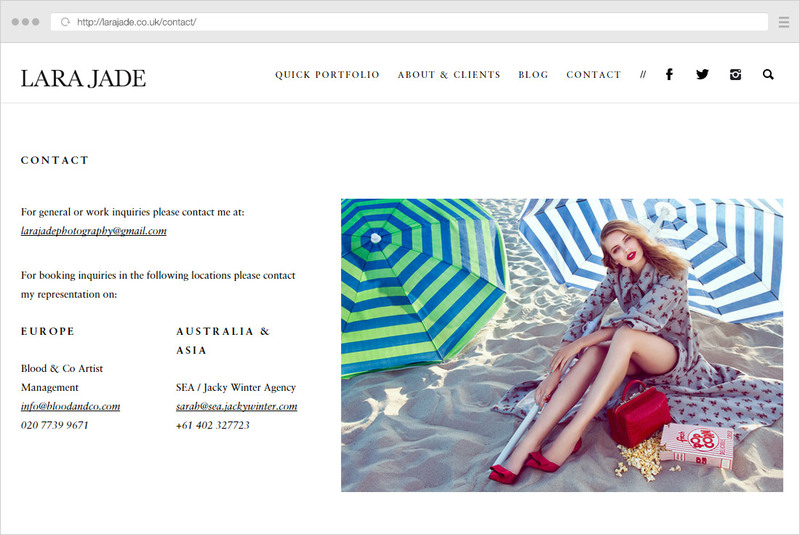 And if you accept international projects and are willing to travel, you should definitely also “advertize” that on the Contact page, clients must know they’re within your reach. Obviously, if you don’t work with clients in person and don’t have a studio, you don’t need to display a very specific mailing address. Just your state/country would be useful though. First of all, an email address and a contact form don’t exclude each other. They both cater to different types of visitors, so keep them both. A contact form allows people to send a quick message right then and there, without having to switch over to their email client. 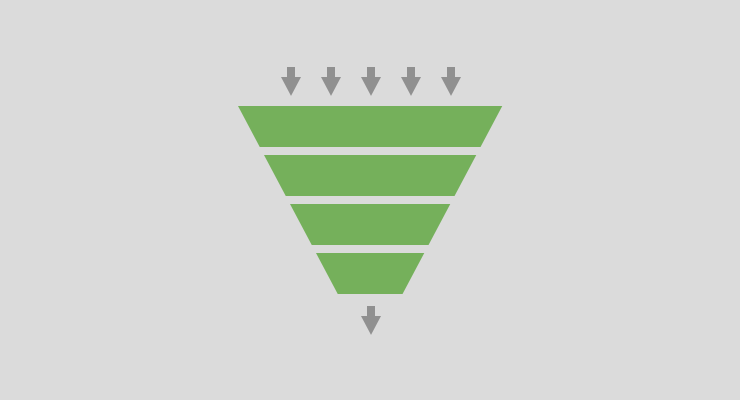 Here are more insights on optimizing Contact pages for conversions. If you run a local photography business, you need to be available for calls. Don’t forget the prefix or country-code for international users. As with optimizing the email link, there’s a great trick you can do here too: use regular spaces between digit groups. Mobile phones & tablets (in the hands of your visitors) then recognize them as phone numbers and turn them automatically into “links”. One tap and people get a call prompt (instead of having to manually copy-paste or remember it). Or better yet, turn it into a click-to-call link. If you’re a larger company/agency, include all appropriate contact names and departments on the page. 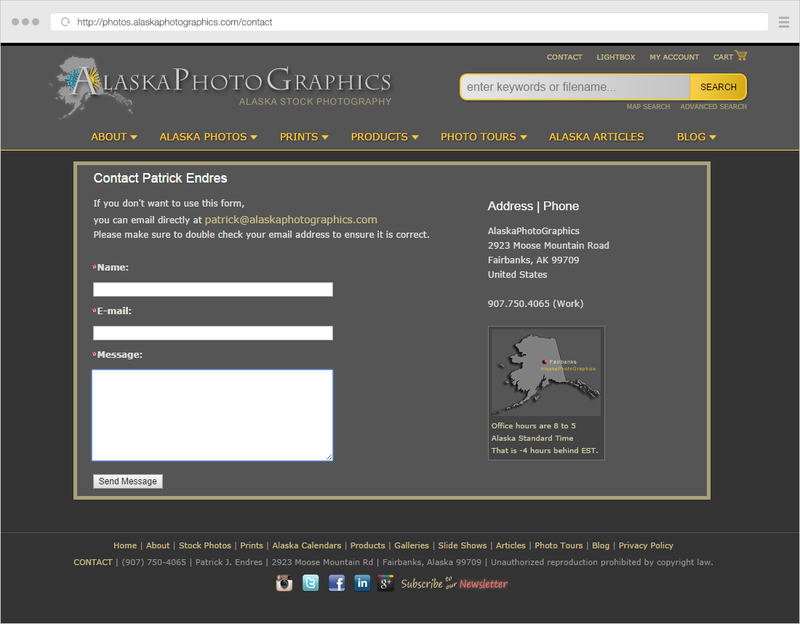 Bonus: if your photography business entails frequent phone calls, take this one step further: put your phone number in the header (above or inside the navigation, throughout the site). Consider adding just a sentence or two in order to help your target audience make better decisions and get closer to contacting you. But don’t go overboard (by writing entire paragraphs here), keep it action and value oriented. You can mean a lot by saying little. 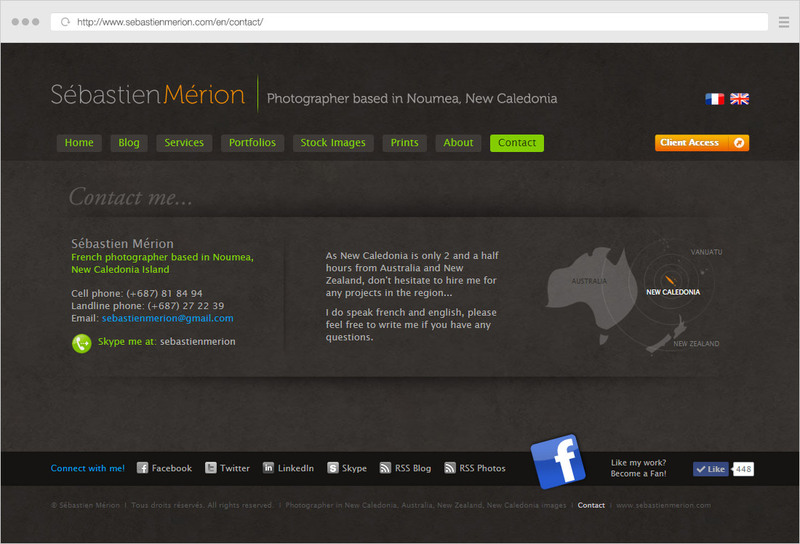 If phone is not your thing, add Skype buttons or Google+ Hangout buttons to your site. Some people just want to leave you a quick message. While email is sometimes cumbersome, Twitter is great for that. List all the social media profiles you have, all the ways people can get in touch with you. And make sure you do check those profiles/inboxes, otherwise messages will get lost. Otherwise, it might be a distraction, don’t have it there. Write an FAQ and put it at the bottom of the contact page, in a discreet manner. Always make it short and to the point. FAQs are great for defining some ground rules and setting expectations, so use them to your advantage. If you’re using email marketing to help drive your business forward, adding a newsletter subscribe option to your Contact page makes sense. But having a separate subscribe form (that conflicts with the main Contact form) is not the way to go. Instead, look for ways to include a discreet subscribe option directly into the Contact form (like these “MailChimp for WordPress” or “Contact Form 7 MailChimp Extension” plugins). Most website owners set the option to be automatically checked (so it’s an “opt-out” version), which helps with the subscribe rate. A self-portrait does have its purposes (making the site more personable, more trustworthy), but here’s not the place. The About/Bio page is better suited for it. On the Contact page, it simply distracts people from writing the message. If you combine About & Contact (which I don’t recommend), make sure you’re providing enough info about yourself and include a portrait, without it being too much of a distraction from the contact information. Sarcasm warning: why not also play some music here or include a YouTube video of cats chasing laser pointers? I don’t see why you’d want contact messages to be public. This is not a blog post, comments are too distracting. Please make sure everything is working well on phones/tablets too, the contact form is probably the most important website functionality you need. Always thoroughly test your own contact form, and ask some friends to do it too. It’s best to filter out any problems from the get-go. Try it out with wrong/missing info too (to test your form validation script). As a general rule of thumbs, your website should require as few steps as possible to get visitors to your desired destination, whatever that may be: browsing specific galleries, a purchase page, the contact page, a signup form etc. However much value you place on people sending you messages/emails, I recommend always having a menu item called “Contact” in your navigation. If you’re a group of people, using “Contact Us” is also common. Any other phrasing (“How to reach me”, “Get in touch” etc.) is not as recognizable and might create confusion and limit the number of messages you get from visitors. I know you might already be having too many items in your navigation, but don’t sacrifice “Contact”, it’s one of the most important links to have there. In terms of placement, people expect seeing it last in the menu, so unless you have good reasoning not to, that’s the place to put it. 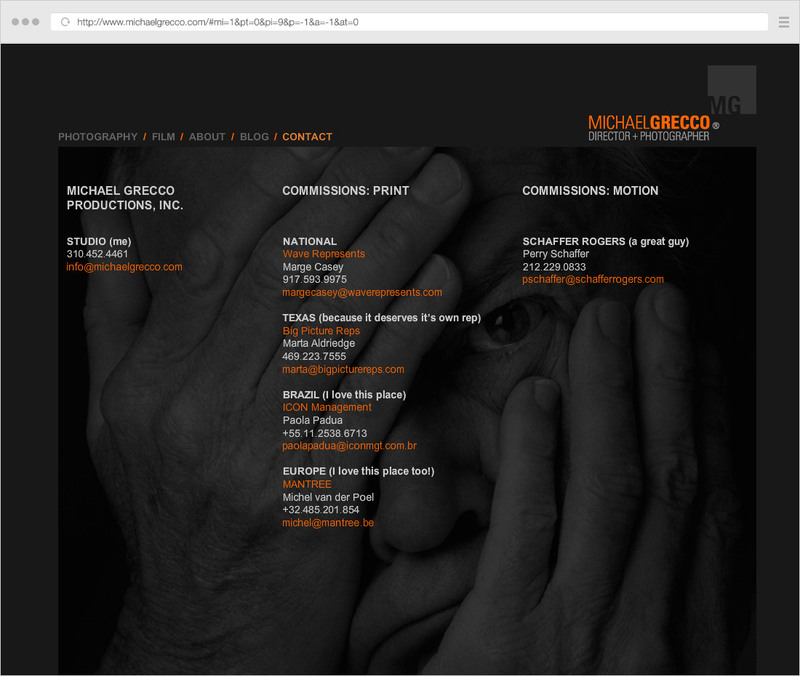 To get inspired, here are some good examples of Contact pages. 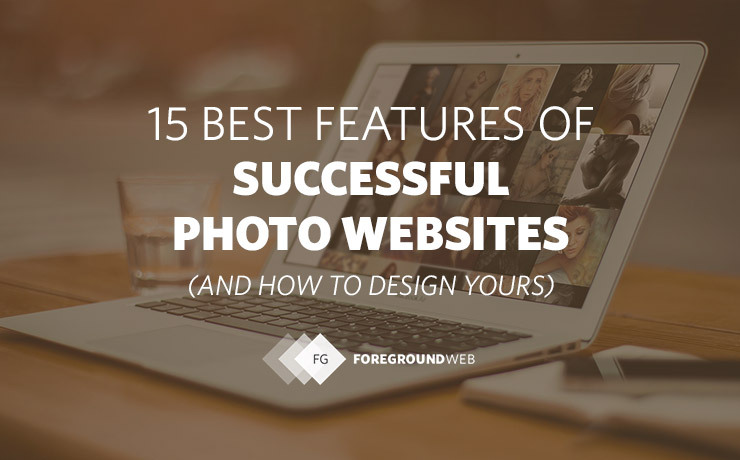 It’s clear that these photographers really payed attention to their Contact section of the site, instead of spending all their creative energy on the portfolio or homepage. 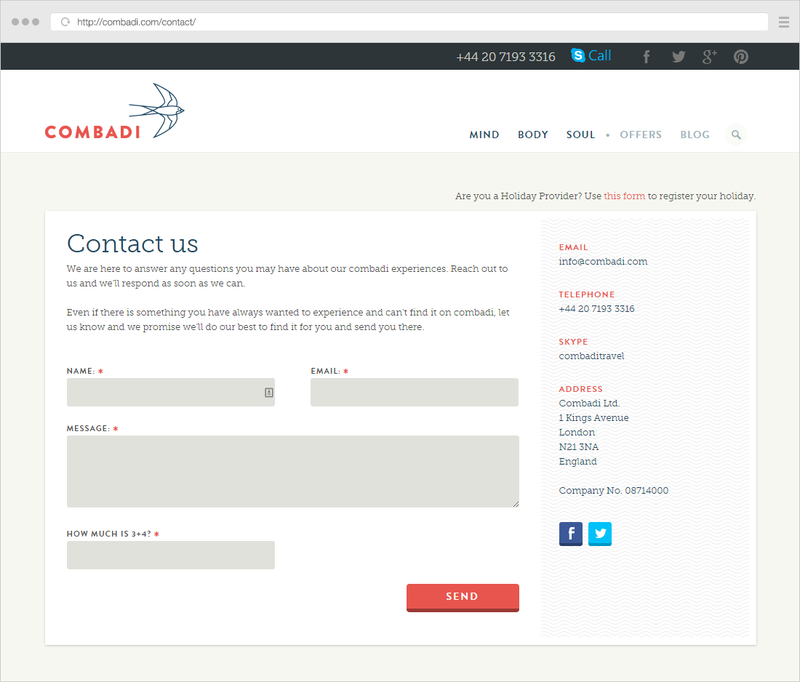 Not photography-related, but Combadi’s Contact page is close to perfect. 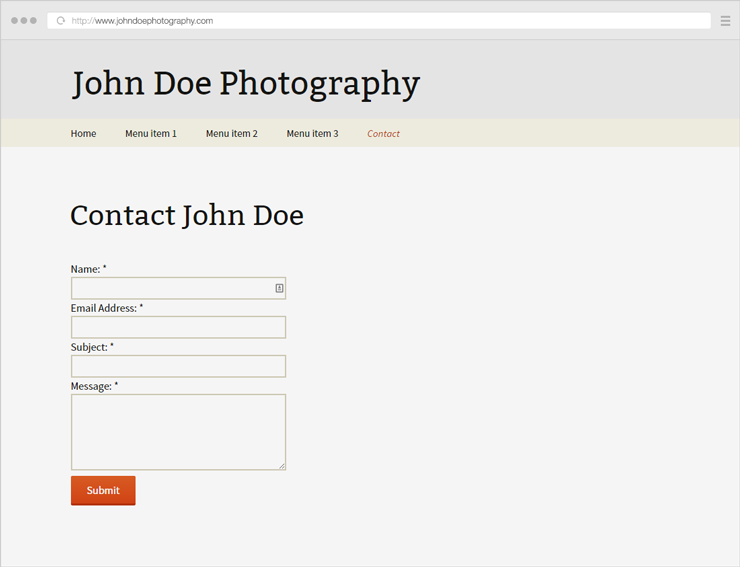 Following this article, I was recently contacted by New Hampshire photographer Erin Paul Donovan to improve his own photography Contact page. Can I replace the “Contact” link in the navigation with a small email (envelope) icon instead? No, I don’t recommend it. 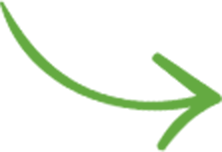 The envelope icon is usually used to link to the email address directly (for sending an email with the user’s default email client). You shouldn’t use such an icon alone to link to a Contact page. I understand the value of showing a phone number, but I’m concerned with getting calls at bad hours or at night. What can I do? By all means, write your available hours there (example http://brownscourt.com/contact/). Also include your time zone to be sure. Aside from this, just set your phone to “Do Not Disturb” mode, protect your private time. Notice I intentionally only covered the right/wrong elements to include on the page. How you arrange and display them is up to your creative skills, but should consider hiring a professional web-designer if you have little experience. 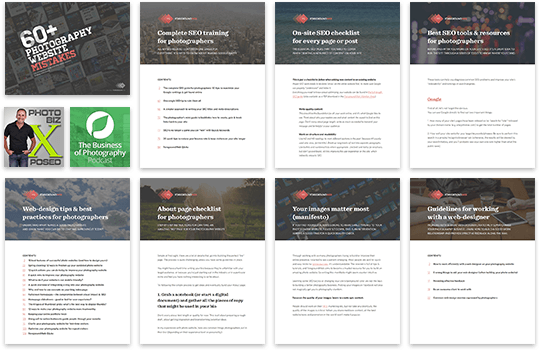 Check out the examples above (and the links at the end of the article) to get some more design inspiration. I don’t have any web-design experience. How do I add a contact form to my page? Use tools like Wufoo, BetterContactForm or 123ContactForm. 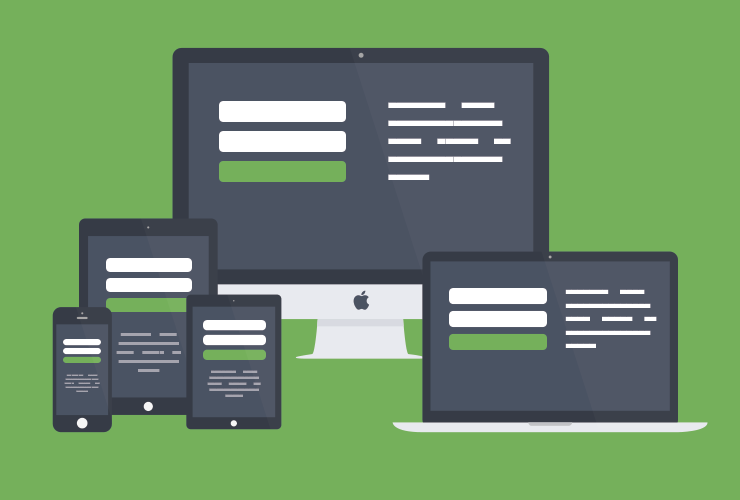 If using WordPress, try the popular Contact Form 7 plugin. To recap, just put yourself in your visitors’ shoes: make things as accessible as possible. 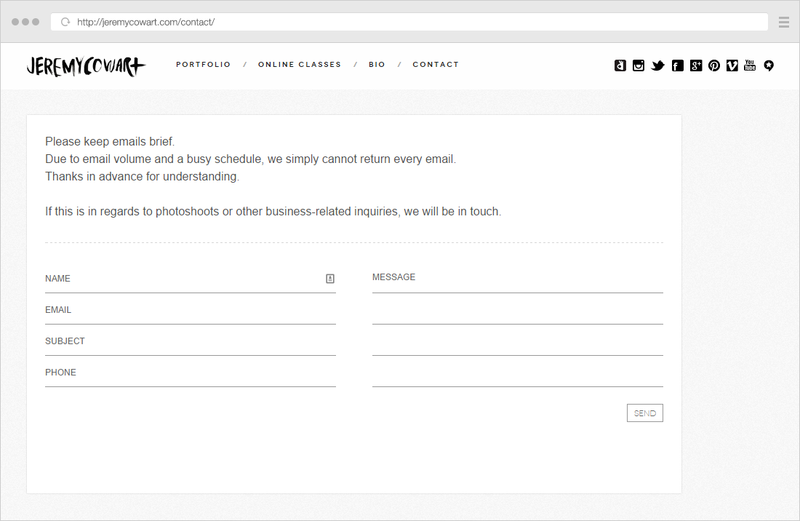 In some cases, the Contact page is the last thing visitors see before deciding on working with you. So give this page the attention it deserves, don’t let it stand in the way of your business goals. What elements are most important to you and how did you improve your Contact page?